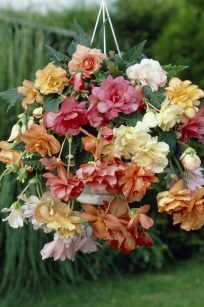 With proliferous flowers that tumble over the sides their containers, Begonias have become very popular for use in hanging baskets. Begonia Odorosa Bulbs will delight you with abundant flowers. The single and double blooms up to 6” across have ruffled petals and grow amid lush bright green foliage. Enjoy cascades of flowers from early summer through the first frost. 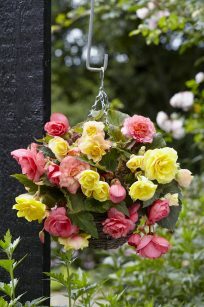 With proliferous flowers that seem to tumble unendingly over the sides their containers, Begonias have become very popular for use in hanging baskets. 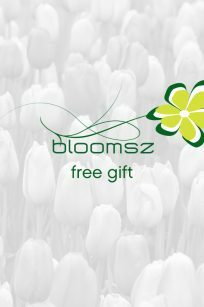 Bloomsz Pastel Hanging Basket Begonia Bulbs will delight you with abundant flowers in pastel shades of orange, pink, white, and yellow. The single and double blooms up to 6” across have ruffled petals and grow amid lush bright green foliage. Enjoy cascades of flowers from early summer through the first frost.